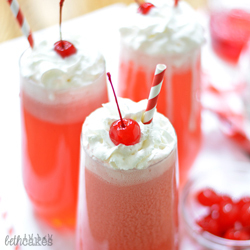 On Friday I posted my first ever Friday Faves, and one of the links was to these Raspberry Vanilla Sodas. I absolutely love the way they look, especially that vibrant color! 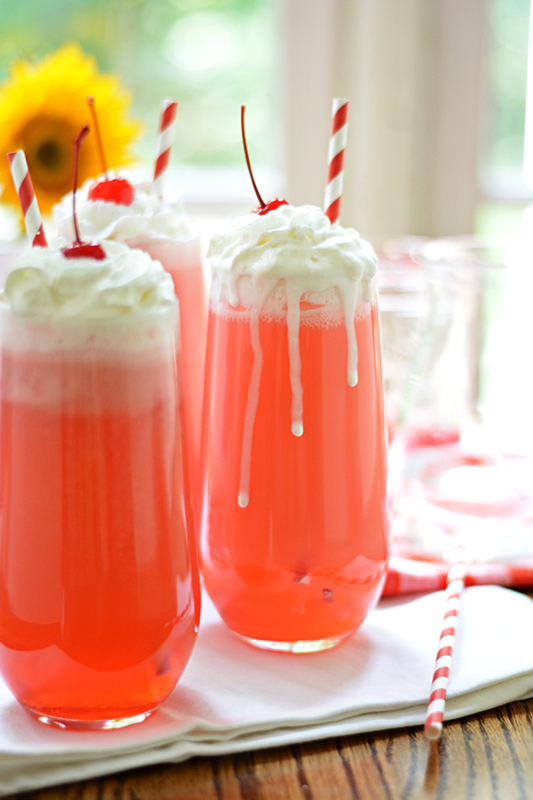 It also reminded me of these homemade Italian cream sodas that I saw on Pinterest forever ago. Look at that cream! So needless to say, I decided I finally needed to make some. 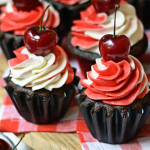 I had a bunch of cherries leftover from these Bourbon Black Forest Cupcakes, plus a jar of maraschino cherries in the fridge, so I went with a combination of those for the main flavor in these sodas. 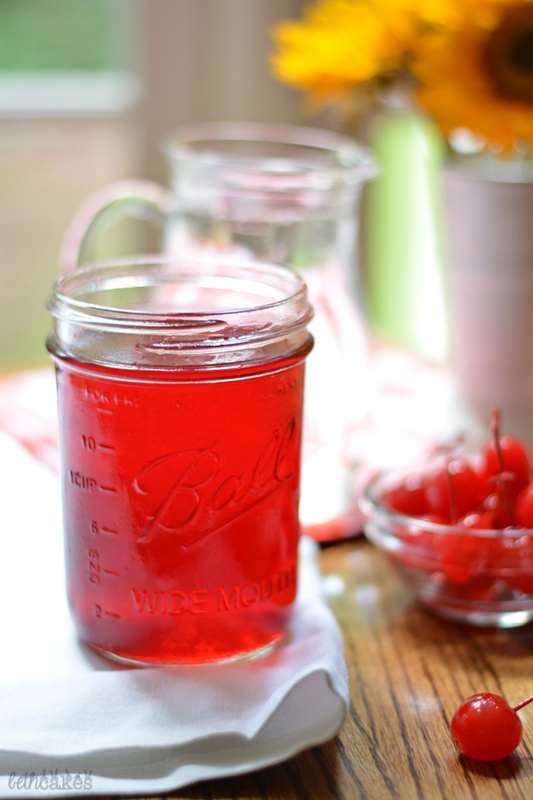 Did you know you can freeze cherries? You probably did. I had never tried that before, but it totally works! 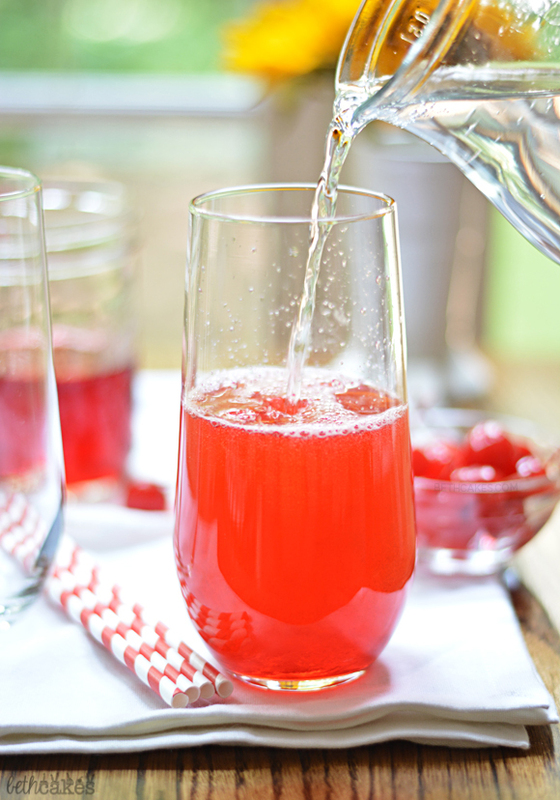 These sodas start with a simple syrup–sugar, water, and cherries. 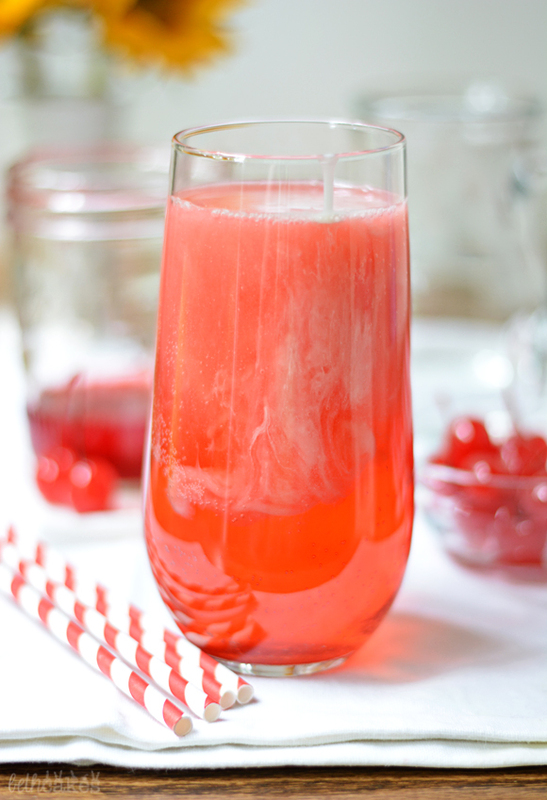 If you’ve got some store-bought, flavored drink syrups, those will definitely work too. And pretty much any fresh fruit will get the job done! There are tons of possibilities. 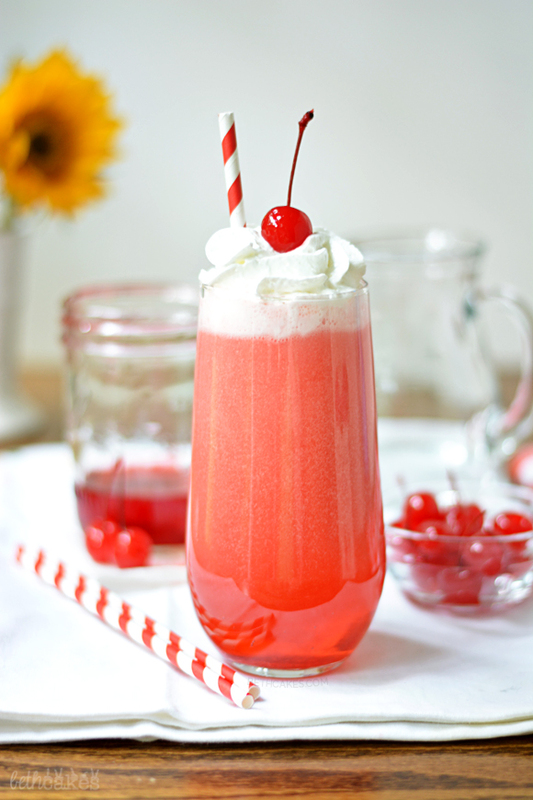 After the syrup has chilled in the fridge, you just add some to a glass, add some bourbon (because they needed something extra), club soda, a tablespoons or two of cream, and top them with whipped cream and a cherry. I mean…I would be lying if I said I didn’t make these just to see the cream swirl in the glasses. It’s true. Drinks are pretty much naked without striped paper straws, so definitely don’t leave those out. I have to admit, they’re pretty cute with these drinks. Totally completes the look! I don’t think I’ve had many cream sodas or Italian sodas. You know? I’ve never ordered one at a restaurant. Or a diner–that probably makes more sense. But I think these would be so fun for a birthday party or diner/themed party. They’re extremely easy to throw together and don’t require many ingredients. You can even make the syrup in advance and store it covered in the fridge, which is what I did, and make the sodas the next day. 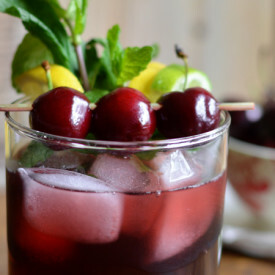 In a medium-sized saucepan over medium heat, bring cherries (and any juices), water, and sugar to a simmer. Cook for about 30 minutes, until the syrup mixture has thickened slightly and the cherries are wrinkly. Remove from heat, strain mixture through a sieve and discard the solids. Cover and transfer syrup to the fridge until chilled. This really depends on the size of the glasses you're going to use, but here's what I did in mine: add 1/4 cup of the syrup to each glass. Then add two tablespoons of bourbon, 3/4 cup Club Soda, and 1-2 tablespoons of cream. (As long as you keep a 1:3 ratio of syrup and club soda, you should be good to go.) 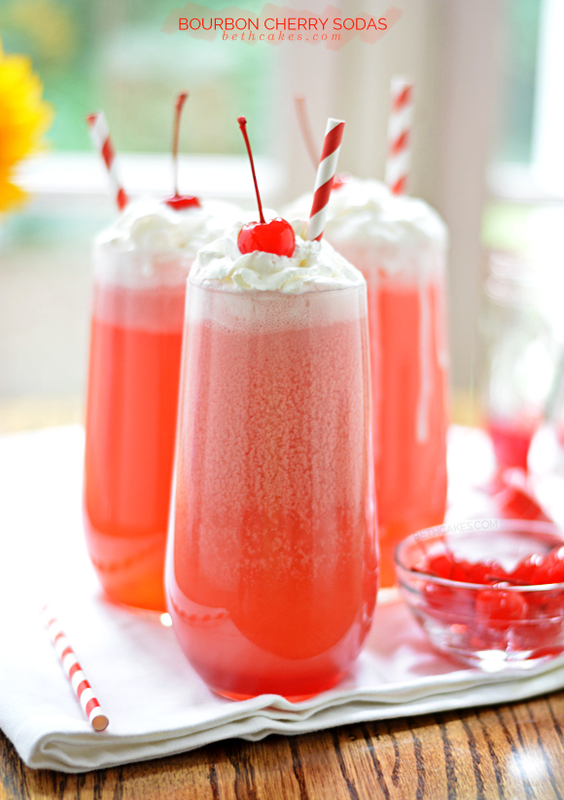 Top each glass with whipped cream and a cherry. Enjoy! 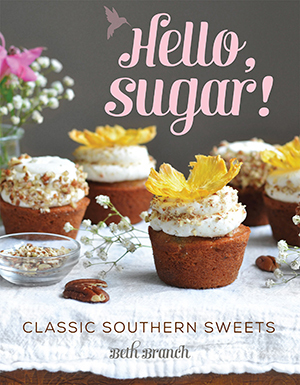 Recipe adapted from Celebrating Sweetness. 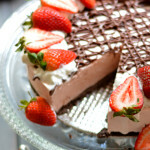 All images and content from bethcakes.com are copyright protected. Please do not use my images without permission. Thank you. Gorgeous photo’s, I love the step by step process you’ve captured. They look so summery and yummy. Uhm, yum! 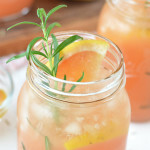 This looks like a perfect summer drink! Loving the color! 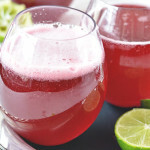 You’re on a roll with all these delicious drinks! These are so cute. I haven’t had an italian soda in years! I’m definitely due for one or two. I’m such a sucker for everything cherry lately. I just want to lay everything aside right now and sip away at one of these. Thanks, Melanie! 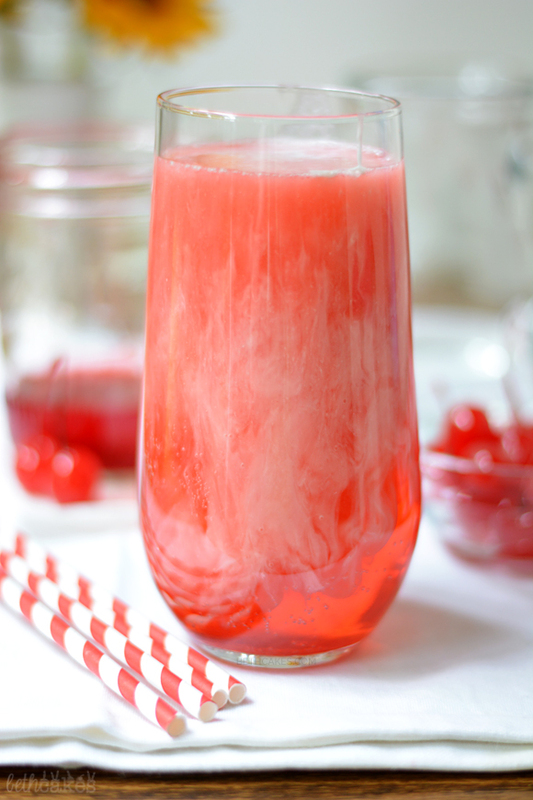 I want to make so many things with cherries right now. They’re too pretty! Hope you have a great week too! These are so pretty!! I would make them just to see that gorgeous marbling of cream too 🙂 Perfect for summer!! Thanks, Zainab! I had so much fun with the cream part of these, haha. These were the perfect summertime drink! They tasted every bit as good as the photos look! I need one of these tonight, love the flavors Beth. Your pics are really great, nice job! These would be fun at a bbq! 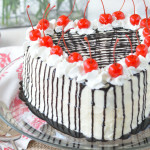 I don’t think I’ve ever made anything with cherries before this either, haha. Thanks, Kelly! I saw these gorgeous drinks on Instagram this morning and have been thinking about them ever since! I don’t think I’ve ever had a cream drink before, but I’m definitely going to start with this one. Ooh yum! These look awesome and so fun 🙂 Love the colors and your presentation! 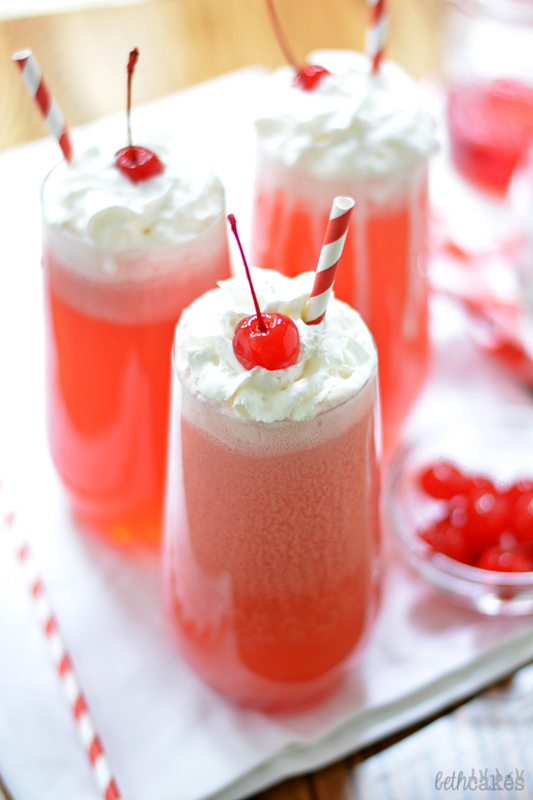 I remember making cherry sodas as a child! 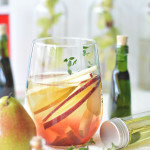 The addition of the Bourbon makes these the perfect adult summer beverage! These look awesome!! Such great photos. I have to give this a try! How cute are these! Absolutely love them, and they sound so so delicious. Pinned!